Flores was chosen from hundreds of candidates in government, academia and Corporate America for the Top 50 list that will be published in the magazine’s May issue. His selection was based on his “progressive leadership, achievements in helping to advance access to technology, demonstrated effectiveness in engaging technology within the global market economy, and his contributions to further technical literacy within the Hispanic community,” the magazine announced. “I am deeply honored to be chosen by Hispanic Engineer & Information Technology to join this prestigious list of today’s Hispanic leaders who share a commitment to remove barriers and open new doors for tomorrow’s Hispanic leaders in business and technology,” Flores said. Flores presides over an association of 340 colleges and universities that collectively serve more than three-fourths of Hispanic higher education students in the United States. Since becoming HACU’s president and CEO in 1996, Flores each year has led efforts to win multi-million dollar funding opportunities for the Hispanic higher education community to enhance business and technology programs and outreach. Hispanics, who make up nearly 15 percent of the U.S. population, represent only 4 percent of the country’s science, engineering and technology work force. HACU has successfully advocated for national legislation to help bridge the ‘digital divide’ between minority and non-minority populations, and oversees scholarship programs targeting talented students in business and technology fields of study. HACU also oversees numerous programs and partnerships to bring more information technology expertise and resources to its membership. 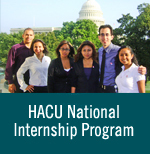 The HACU National Internship Program, the country’s largest Hispanic program of its kind, each year offers paid internships to top students majoring in business, technology and other fields where Hispanics are under-represented at participating corporations and federal agencies. HACU’s national and international conferences have become powerful springboards for winning new support for Hispanic students from kindergarten through graduate school. Previously named one of the “100 Most Influential Hispanics in the United States” by Hispanic Business Magazine, Flores has received numerous awards for his leadership and advocacy for higher education access, equity, and success for the nation’s youngest and largest ethnic population. Flores is chair of the Hispanic Association on Corporate Responsibility (HACR), a coalition of the most prominent Hispanic organizations that promotes Hispanic leadership initiatives and the equitable representation of Hispanics in Corporate America. He also is chair of the ¡Adelante! U.S. Education Leadership Fund, which each year offers leadership and professional development training to top Hispanic college students. Flores is a founding leader of the Alliance for Equity in Higher Education, the nation’s first unified voice for the college and career development needs of minority college students, which includes the National Association for Educational Opportunity (NAFEO) and the American Indian Higher Education Consortium (AIHEC). Flores is a former director of programs and services for the Michigan Higher Education Assistance Authority and the Michigan Higher Education Student Loan Authority. He is a veteran of higher education teaching and administration ranks at community colleges and major research universities. He is a member of numerous associations, including the American Educational Research Association and the American Association for Higher Education. Flores also serves on the board of the National Hispanic Leadership Agenda and served on the board of Teach for America. Flores holds a Ph.D. in higher education administration from the University of Michigan-Ann Arbor and a Master of Arts degree in counseling and personnel from Western Michigan University. He obtained undergraduate degree in business administration and elementary education from, respectively, Universidad de Guadalajara and Centro Normal Regional in Mexico.